Born in Leith in 1962, Craig and Charlie Reid grew up in Edinburgh, Cornwall and Auchtermuchty in Fife. At home, they listened to early rock ‘n’ roll and country greats such as Jerry Lee Lewis, Merle Haggard and Hank Williams. At school they played in punk bands and formed The Proclaimers in 1983. With a fervent live following growing in Scotland, particularly in Inverness where they performed regularly, their first big break came late in 1986 when they were invited to tour with The Housemartins. Then in January 1987 they made a now seminal appearance on the Channel 4 pop programme The Tube, performing Letter From America & Throw The ‘R’ Away. Singing in regional accents about Scotland – its emigration and its politics – they were a far cry from the mid-Eighties playlist staples of Rick Astley and Sinitta, and became a phenomenon almost overnight, signing to Chrysalis within a month and recording their debut album acoustically, This Is The Story, a week later, produced by the man who also signed them to Chrysalis, John Williams. Voted NME Readers Best New Band that year, they toured the UK extensively and a new ‘band’ version of Letter From America, produced by Gerry Rafferty went Top 3 in November. Complementing their raw, stripped down delivery with the greater musical scope of a full band, they then embraced country and rock on their second album, 1988’s Sunshine On Leith produced by Pete Wingfield, which also saw them form their first full live band and go on a 9 month World tour. In addition to the deeply moving classic title track which has gone on to be an anthem for Hibs fans, the album featured hit singles, the raucous, euphoric I’m Gonna Be (500 Miles) and I’m On My Way. In 1989 ‘I’m Gonna Be’ spent 6 weeks at number 1 in Australia and a was a top 10 college radio hit in USA. The song went on to soar to No. 3 during a 6-month reign in the US Billboard Singles Chart in 1993 after appearing on the soundtrack of the Johnny Depp film Benny And Joon. I’m On My Way also re-emerged in 2001 when it subsequently accompanied one of the pivotal scenes in the hit movie Shrek. Craig and Charlie have reached the rarefied status that few have been able to achieve: with nearly three decades of career longevity, they are as innovative as ever and with every album and show played, they’ve continued to garner new fans. 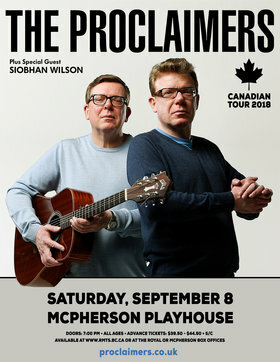 Their songs have been used extensively in adverts across the World and the list of movies they have featured in includes The Commitments, The Crossing, Mama’s Boy, Bottle Rocket, Benny & Joon, Shrek, Dumb & Dumber, Bye Bye Love, Burke And Hare, The Angel’s Share, Bachelorette, Perfect Pitch.